What’s Buzz? Quite simple, it is a compact electric buggy that buzzes around Rome’s ancient streets since 2012. It carries two people, it is a synch to drive, it doesn’t pollute and the opportunities of getting you from A to B are endless. Buzz is also considerably smaller than a golf cart and is therefore easier to park. We’ll take this statement further and say that it is far easier to find space for two Buzz buggies, than it is for one golf cart. Speed is not an issue when you’re sightseeing but keeping up with the traffic certainly is; Buzz can travel up to 45Km/h while a golf cart can only do about 25 Km. In our ever crowded and frenetic cities, where time and health are the most important assets, the need to create a mode of transport that allowes great freedom of movement, has zero impact on the environment and makes driving fun and relaxing, has made itself felt. A vehicle that can keep in touch with the world, be safe, offers unlimited scope for exploring and makes your driving experience about as fluid as the new reality we live in. Buzz has come about for all those reasons. When Peter, the founder of Buzz4tours, first saw a Buzz he immediately thought of using it for tourism in Rome, the Eternal City that hosts some of the most famous monuments in the world but where traffic can also be eternal. There is in fact so much artistic beauty to see in Rome and visiting all of it could become a sizeable problem because of the chaotic traffic that slows your movements. Why rely on public transport or cumbersome traditional cars and perhaps return home with that unnerving feeling that you’ve missed out on something simply because you ran out of time? 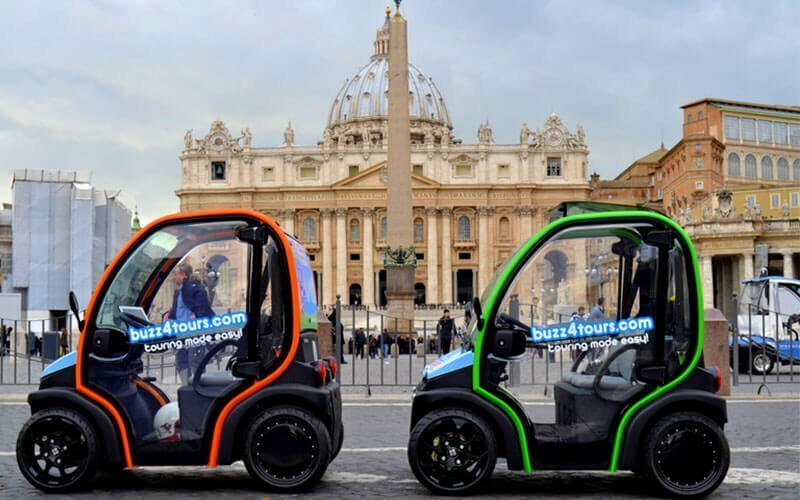 With Buzz you’ll be able to zip around Rome’s hidden alleyways to admire places off the beaten track and you can do so with an innovative vehicle which will not alter the delicate balance. You’ll be able to enter all the traffic restricted areas of the city knowing that parking will never be an issue given the compact size of Buzz… by the way, parking is also absolutely free! All you’ll need in fact, is a valid driving license and a lot of ‘drive’ to explore. Buzz will provide free wi-fi and an iPad, so you will always be connected and can share the excitement of the new places you are visiting with your friends. The iPad also turns into a personal hotspot for your convenience. Buzz will also suggest where to go and it will also guide you there. This happens thanks to the pre-set routes on the iPad’s GPS navigator which offers three different itineraries to choose from. All you really need to do is just ‘’click & drive”. In any case, let’s face it, driving Buzz is a lot of fun!